Say “I LOVE YOU” to your skin! 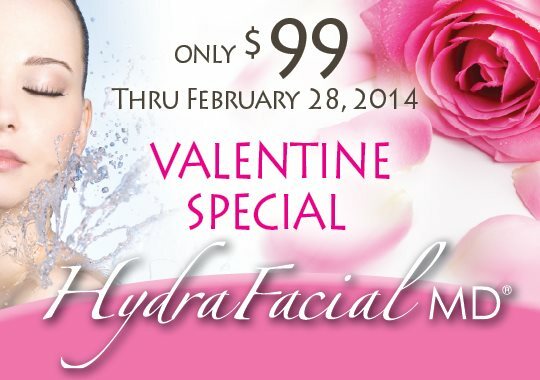 Celebrate this Valentine’s Day with a $99 HydraFacial treatment at SKIN the Spa. The treatment, a favorite with Hollywood stars including Kate Winslet and Amy Poehler, leaves skin radiant and healthy by stimulating, exfoliating and hydrating your skin. The special price is offered through February. The HydraFacial serums specifically target skin issues including sun damage, blackheads, whiteheads, pores, brown spots, uneven skin tone, and fine lines and wrinkles. The HydraFacial is a soothing, moisturizing, non-invasive skincare treatment for anyone who is looking to improve and maintain the health of their skin. Proven effective for all skin types, this 30-minute treatment delivers instant results with no discomfort or downtime. Try one. You’ll be IN LOVE with your skin! GIFT CERTIFICATES are always perfect.